European Commission chief Jose Manuel Barroso chose an unusual way to bid farewell to MEPs, the member states and citizens. During his traditional address about the state of the union the former Portuguese prime minister, who is nearing the end of his second term in office marking an entire decade on top of the Commission in some of the most stormy devastating and in the same time boiling with construction activities times, made something like a report about what had been done without too much "me" inside. He managed to tuck the entire wild decade in a little more than 40 minutes long assessment which he called "realistic", plus another 20 minutes of blunt attacks and drawing of division lines for the European elections next year. Barroso attacked simultaneously the member states, the nationalists, the populists, the ordinary critics and stated firmly he was specifically addressing the pro-European forces. Barroso's second term coincided with the eruption of the severest crisis since the creation of the euro area and the EU at large - the debt crisis which revealed not simply deep interconnectedness inside the EU and especially the zone of the single currency, but the close links with the global economic organism. This was the period of scoring historical records in the speed, intensity and polarity of the European debate. The EU summits turned not simply into interesting events for a broader circle of European and non-European citizens, but they were even anticipated impatiently. Markets, journalists, politicians, voters, bloggers waited until the early hours of the day the leaders to come up with a solution to another acute problem on the row - from Greece through the work of credit rating agencies to the construction of the banking union. In the beginning, work was intensive and unanimity reigned up to the moment when the measures started to cause pain. Then the tension started to go up proportionately to the reduction of incomes and the increase of the number of unemployed in the most vulnerable countries. It came to a severe confrontation between those who believe that limiting spending and belt-tightening was the right path and the others who were convinced that a good result can be achieved with less pain. But the crisis, according to Barroso, which the EU has not exited yet, is not cyclical, but structural which means that things will never go back to where they were. "We have to shape a new normal", he said and pointed out that currently we are in a period of transformation. A time when we have to change even our mindset. This is a direct message to all those who believe that the good times of prosperity will be back. Barroso told them we were in one boat in the good times, we are in the same boat in the bad times. You cannot say that only one end of the boat is sinking. That is precisely why he noted that the biggest risk is political not economic - that is the lack of stability and determination. Europe has to go beyond economy because it is not simply a market, he said obviously against the visions of UK PM David Cameron about the EU. Europe is also values, based on political, social and economic standards. And, of course, the invariable model of social market economy. Integration is another highly controversial issue. EU is split into two camps - one encompasses those who believe that more integration has led to the current troubles, while the others are convinced that all problems stem from less integration. For Barroso, however, more integration is the only solution as throughout its entire history EU is a living proof that this is the best solution. He went back to World War I to show that integration always brought good. And for those who criticised the EU for all the evils in the transforming states, especially Greece, the former Portuguese premier reminded them clearly in his speech that the crisis is the result of mismanagement of public finances by national governments and by irresponsible behaviour of the financial markets. "Some people will say that Europe is forcing governments to cut spending. But we can remind voters that government debt got way out of hand even before the crisis, not because of but despite Europe", added the European Commission chief. In the end of the debate with MEPS, which lasted two hours, he again inflamed himself on the issue and quit all the political correctnesses that was until recently maintained with regard to Greece. "One of you said Greece was a victim of the policies of Europe. False! Completely! Greece is the victim of the irresponsible behaviour of the governments of Greece. This is the reality! ", he said and recalled that if it was not for EU's assistance Greece would have long become insolvent and its situation would have been much worse. "Europe has not created the problem. 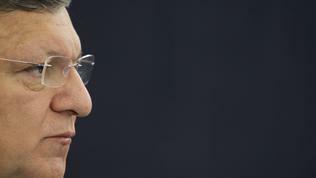 Europe is a victim of the problem and is part of the solution", Barroso added. His blunt assessment did not spare the member states, too, which he accused of Europeanising failures and of nationalising successes. 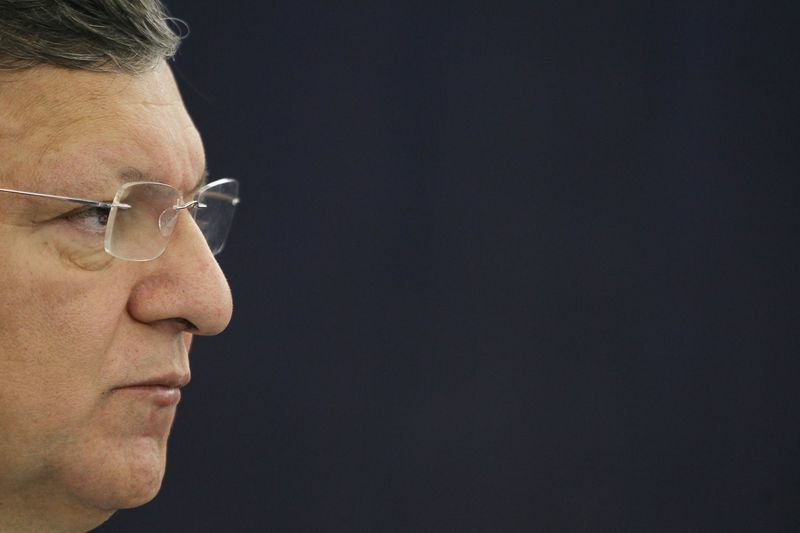 In this spirit Barroso called on the MEPs to use the upcoming European elections to explain to the citizens that the member states entrusted Europe with tasks and competences. EU is not a foreign force, it is the result of democratic decisions taken by the European institutions and the member states. 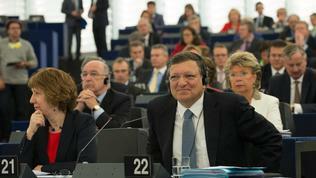 This was probably Barroso's first address in front of MEPs which lacked applause or if there were they were very weak. Maybe because in the end of his term in office he afforded himself to say what he really thought about the MEPs and the situation in the EU in general. Things that were kept aside for long for the sake of good inter-institutional partnership. In this sense was his hint that EP was overreacting with the pressure on the member states on the multiannual financial framework. In an outburst of rage from another demand to cut the total amount of the budget, the chief of the group of Socialists & Democrats in the European Parliament, Hannes Swoboda (Austria), turned to the representatives of the Council (Lithuania) and asked them why did they retreat from the agreement. 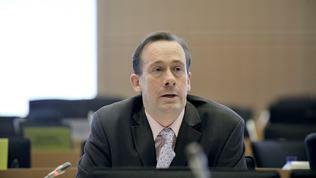 But Barroso recalled that the Commission and the EP both wanted more resources. "We have been in that fight together. But even so, one single year's EU budget represents more money - in today's prices - than the whole Marshall plan in its time! ", he reminded thus making a polite hint to the Parliament for reconciliation and fast agreement so that the budget can start financing programmes as of January 1st 2014. There is no way Europe to speak with passion about the rule of law around the world and not have ensured it in its own backyard was another message by President Barroso. Rule of law is a challenge which the EU faced after the big bang enlargement in 2004-2007 when the union bubbled up with 12 new member states, most of which infected with the stable virus of totalitarianism. The cure of the diseases with the antibiotic of equality, democracy and numerous statements proved ineffective. After temperature rose in Hungary, Romania, but also Bulgaria and Slovenia, the Commission and the member states found out that a stronger antibiotic was needed. Four member states from the northern part of the union demanded a mechanism that will supervise the adherence to the rule of law. And Barroso responded. He announced that the Commission will soon come up with a communication on the matter because the debates on this issue are key for "our idea of Europe". What will you tell your voters? 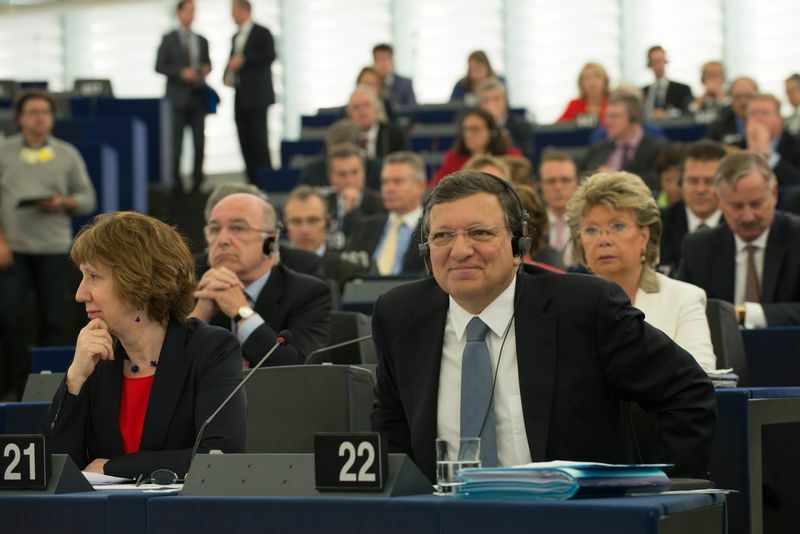 Barroso was blunt in his address with regard to the upcoming elections for the European Parliament on May 22-25 next year as well. He directly asked the MEPs as "legitimate political representatives of the European Union" what picture will they present the voters with. "The candid version, or the cartoon version? The myths or the facts? The honest, reasonable version, or the extremist, populist version?" Some will campaign that the EU gives too much money to vulnerable countries, while others will claim the opposite. There will be claims that Europe is to blame for everything and also that it rarely intervenes. "But every one of us can explain what we did and why: there is a direct link between one country's loans and another country's banks, between one country's investments and another country's businesses, between one country's workers and another country's companies. This kind of interdependence means only European solutions work". It was along this line that Barroso was criticised the most. By the Socialists and the Liberals for having done too little for the European integration, while by the Conservatives and sceptics that the existing model has proved clearly that it does not work. 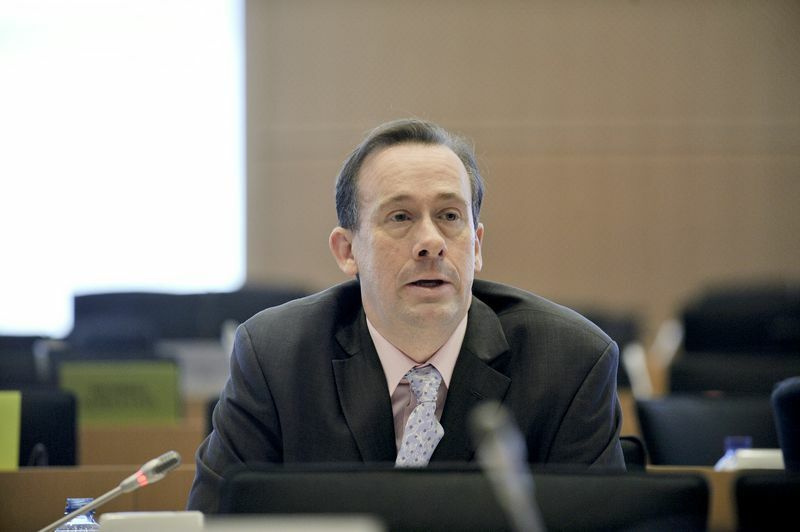 Martin Callanan, leader of the group of European Conservatives and Reformists (representing David Cameron's tories) said that the interventionist, centralising and socialist approach was already tested and now it is time for something new - for a new euro-realistic direction. According to Callanan, however, there were no big hopes that Barroso's successor would bring any change because all candidates for the position were representatives of the status-quo. He mentioned most of them by name - several commissioners attending the plenary and the European Parliament chief Martin Schulz, about whom euinside wrote extensively. Barroso's response was overwhelming and unexpected. He furiously attacked Callanan telling him that the British tories were a poor copy of the eurosceptics of Nigel Farage's UKIP which will turn into a first political force. You more and more look like UKIP, Barroso said and added that even if Callanan wanted to stand for the European Commission seat he would not have had any chances. And that, he said, is not a good news. In the end of the debate Barroso put all his cards on the table saying that he would continue to work for the deepening of the EU integration. By the elections many new proposals related to his blueprint for the deepening of the Economic and Monetary Union (EMU) will be tabled. He did not hide that he was proud with the blueprint and that it was the solution to Europe's problems at the moment. Fully aware that in the remaining 8 months until the elections the chances for realisation of his bold ideas for federalisation are too weak, Barroso said that their main purpose was to put the European issues at the centre of the election debate. Given, however, that he and the MEPs are completely conscious that the main front line will be between nationalists and integrationists, the European issues will be reduced to the right to work, providing assistance to troubled countries and, all in all, to a slight or even significant weakening of the euro-integrational processes. Maybe that is why Barroso concluded his speech with the appeal not to forget that one hundred years ago Europe sleepwalked to the catastrophe of World War I. "Next year, in 2014, I hope Europe will be walking out of the crisis towards a Europe that is more united, stronger and open". "These are challenging times, a real stress test for the EU. The path of permanent and profound reform is as demanding as it is unavoidable. Let's make no mistake: there is no way back to business as usual. Some people believe that after this everything will come back as it was before. They are wrong, This crisis is different. This is not a cyclical crisis, but a structural one". "And does everyone still remember just how much Europe has suffered from its wars during the last century, and how European integration was the valid answer?" "In Europe, we believe that, ultimately, only a political solution stands a chance of delivering the lasting peace that the Syrian people deserve". "Not everything needs a solution at European level. Europe must focus on where it can add most value. Where this is not the case, it should not meddle". "Safeguarding its values, such as the rule of law, is what the European Union was made to do, from its inception to the latest chapters in enlargement". "The polarisation that resulted from the crisis poses a risk to us all, to the project, to the European project". "So now is the time to rise above purely national issues and parochial interests and to have real progress for Europe. To bring a truly European perspective to the debate with national constituencies".